Thanksgiving is just around the corner when people will be stuffing themselves with food. Some may seek to get a jump on that by looking to marijuana, as it reportedly can increase your appetite and give you the "munchies." Wired reports scientists have found a receptor in the brain called CB1 may be the key driver, as new research finds it makes you feel hungry because it activates a neuron that makes you feel full. Note that we are not advocating smoking weed before you sit down with grandma this Thanksgiving, but are simply pointing out some of the science behind the world of marijuana. We bring this up because banker after banker has contacted us over the years saying they have figured out how to bank marijuana-related businesses, only to seemingly end the practice after a few months due to regulatory pressures. Because there is so much talk in the industry about this subject, we wanted to spend some more time discussing it today. After all, some 20 states now allow usage of marijuana for medical purposes. In addition, CO and WA have gone further and legalized recreational use at the state level. Bankers care about this because business is booming in these states and fees can be had due to so much cash movement around these businesses. Given an inability to collect fees on just about everything else, this is seen as an opportunity so some banks are exploring whether they can do business with such entities and collect fees to do so. To clear the air for bankers, no matter what state you operate in you are still subject to federal laws because your deposits are federally insured. At the federal level, possession and use of marijuana is still illegal--period. That means you could lose your bank charter if you bank marijuana-related businesses no matter your state of domicile. It also means your management team and directors could be fined or even go to jail because doing so breaks federal laws--period. 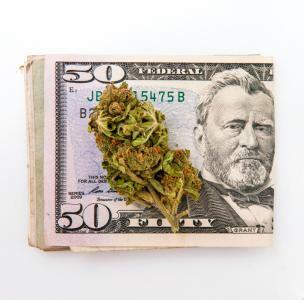 Until the laws change at both the state and federal level, bankers should note that doing business with marijuana-related businesses is periculo tuo ingredere in Latin or "at your own risk." If you are still trying to figure out where a potential opportunity might exist and where the line is perhaps around what is and is not a marijuana-related business, perhaps guidelines from The Financial Crimes Enforcement Network ("FinCEN") will help you. In its guidance on this subject, FinCEN discusses a memo sent by Deputy Attorney General James Cole (the "Cole Memo") that updates guidance to federal prosecutors around marijuana enforcement at the federal level. He instructs prosecutors to use their resources to enforce the laws on "persons or organizations" whose conduct interferes with important priorities that include: preventing the distribution of marijuana to minors; preventing revenue from the sale of marijuana from going to criminal enterprises, gangs and cartels; preventing the diversion of marijuana from states where it is legal under state law in some form to other states; preventing state-authorized marijuana activity from being used as a cover or pretext for the trafficking of other illegal drugs or other illegal activity; preventing violence and the use of firearms in the cultivation and distribution of marijuana; preventing drugged driving and the exacerbation of other adverse public health consequences associated with marijuana use; preventing the growing of marijuana on public lands and the attendant public safety and environmental dangers posed by marijuana production on public lands; and preventing marijuana possession or use on federal property. In addition to this FinCEN guidance, Cole issued supplemental guidance directing prosecutors to consider enforcement priorities with respect to federal money laundering, unlicensed money transmitter, and BSA offenses predicated on marijuana-related violations of federal law. As you can see from the rules and regulations around this subject the states and the feds do not entirely agree so things remain smoky. For bankers right now, until federal laws change, we would argue doing business with marijuana-related businesses probably smells like something distinctly other than success. Market rate expectations cooled down based on lower than expected housing and factory data. Treasury yields dropped 2bps. 1) MB Financial Bank ($15B, IL) will acquire American Chartered Bank ($2.8B, IL) for about $449mm in cash (about $100mm in cash) and stock or about 2.19x tangible book. 2) The First National Bank and Trust Co ($838mm, WI) will acquire Walworth State Bank ($247mm, WI) for an undisclosed sum. 3) Capital Bank ($7.1B, FL) will acquire CommunityOne Bank ($2.3B, NC) for about $350mm in cash and stock or roughly 1.30x tangible capital. 4) Diebold will acquire Wincor Nixdorf for $1.8B, creating the world's largest ATM maker. 5) Hanmi Bank ($4.0B, CA) has made an unsolicited offer to combine with BBCN Bank ($7.3B, CA) in a stock deal that would result in BBCN shareholders representing approximately 65% of the combined company's stock and Hanmi shareholders representing approximately 35%. Nonbank lender Prospect Mortgage (CA) has agreed to pay $10.1mm in restitution and penalties to settle CA state allegations that the company inflated settlement fees and failed to disclose the fees were charged by an appraisal affiliate. A Bank Director survey of the branching plans of banks finds 43% of respondents plan to keep the number of branches they have the same this year, 23% plan to reduce it and 31% plan to expand it. A PwC survey of corporate directors finds the percentage of directors who believe their board "very much" is spending enough time on CEO succession is 48%. That could be a problem given only 27% say the company "very much" has adequate bench strength in its CEO talent pipeline.